These are "alpha" versions. If you encounter errors or would like to make suggestions, please use the contact form below. Concept-Focused Formative Assessment Lessons aligned to the CCSS. This lesson is intended to help you assess how well students are able to decompose numbers less than or equal to 10 into pairs in more than one way. It will help you to identify students who have difficulty anchoring to 5 and 10, identifing different representations of a number sentence, one- to-one correspondence, structuring numbers, and/or addition. This lesson involves mathematical content in the standards from across the grade, with emphasis on Operations and Algebraic Thinking K.OA: Understanding addition as putting together and adding to, and understanding subtraction as taking apart and taking from. This lesson involves a range of Standards for Mathematical Practice, with emphasis on: 2. Reason abstractly and quantitatively. 7. Look for and make use of structure. 8. Look for and express regularity in repeated reasoning. More information, including the CCSS mathematics content and practice standards connected to this lesson are included in the document. Grade 1: Number Relationships, Equal or Not? This lesson is intended to help you assess how well students are able to use various strategies to add and subtract within 20 using various strategies. It will help you to identify students who have difficulty recognizing equivalent equations and expressions, and or using strategies to determine related equations and expressions. This lesson involves mathematical content in the standards from across the grade, with emphasis on: Operations and Algebraic Thinking 1.OA: Understand and apply properties of operations and the relationship between addition and subtraction, add and subtract within 20, and work with addition and subtraction equations. This lesson involves a range of Standards for Mathematical Practice, with emphasis on: 2. Reason abstractly and quantitatively. 7. Look for and make use of structure. 8. Look for and express regularity in repeated reasoning.  Recognizing patterns on the hundred chart. This lesson is intended to help you assess how well students are able to fluently add and subtract within 100 using strategies based on place value, properties of operations, and/or relationships between adding and subtracting. It will help you to identify students who have difficulty recognizing place value of ones, tens, and hundreds, understanding the commutative and associative properties as they relate to the numbers used in addition and subtraction equations, and applying efficient strategies (especially strategies based on place-value, properties of operations, and the relationship between addition and subtraction) to add and subtract fluently. This lesson involves mathematical content in the standards from across the grades, with emphasis on: Number and Operations in Base Ten 2.NBT: Use place value understanding and properties of operations to add and subtract. This lesson involves a range of Standards for Mathematical Practice, with emphasis on: 2. Reason abstractly and quantitatively. 7. Look for and make use of structure.  Recognizing place value of ones, tens, hundreds.  Use correct mathematical vocabulary to explain place value to a partner.  Make connections of place value to previously taught lessons. This lesson is intended to help you assess how well students are able to understand a fraction as the quantity formed by 1 part when a whole is partitioned into equal parts, represent a fraction on a number line diagram, understand two fractions are equivalent (equal) if they are the same point on a number line, and solve fraction word problems using the number line to represent solutions. This lesson asks students to select and apply Standards for Mathematical Content from across the grades, with the emphasis on: Number and Operations – Fractions 3.NF (Grade 3 expectations in this domain are limited to fractions with denominators 2, 3, 4, 6, and 8.) More information regarding the CCSS content and practice standards is included in the document. This concept-based lesson is intended to help you assess how well students are able to use a variety of strategies to multiply. In particular, this unit aims to identify and help students who have difficulties with the traditional multiplication algorithm and representing multiplication in multiple ways. Common Core State Standards: This lesson involves a range of mathematical practices from the standards, with emphasis on: 2. Reason abstractly and quantitatively, 7. Look for and make use of structure, 8. Look for and make use of repeated reasoning. 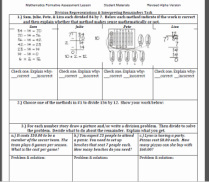 This lesson asks students to select and apply mathematical content from across the grades, including the content standards: Number and Operations in Base Ten: 4-NBT: Use place value understanding and properties of operations to perform multi-digit arithmetic and 5-NBT: Perform operations with multi-digit whole numbers. CLICK HERE FOR REVISED CARD SORT. This lesson unit is intended to help you assess how well students are able identify equivalent decimal fractions. 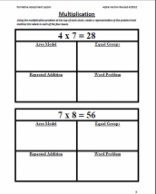 Recognize and generate equivalent fractions. Use words to indicate the value of the decimal. Use decimal fractions and locating them on the number line. Use area models to represent equivalent fractions and decimals. This lesson is a revised form of the lesson, above. Revisions were made by Boone County teachers/coaches (attendees of the Northern Kentucky Mathematics Teacher Leadership Network. Teachers in this school district will pilot this version and provide student work that may result in more revisions being made. Revised versions will replace this one. Enjoy! This concept-based lesson is intended to help you assess how well students are able to use a variety of strategies to multiply. In particular, this unit aims to identify and help students who have difficulties with the traditional division algorithm,representing division in multiple ways, and interpreting remainders. This lesson involves a range of mathematical practices from the standards, with emphasis on: Reason abstractly and quantitatively, Look for and make use of structure, Look for and make use of repeated reasoning. This lesson asks students to select and apply mathematical content from across the grades, including the CCSS Number and Operations in Base Ten: 5-NBT: Perform operations with multi-digit whole numbers and 6-NS: Compute fluently with multi-digit numbers and find common factors and multiples. Students may enter this problem solving task in a multiple of ways. There is student work included for students to anayze as part of the learning process. Click here, or on the icon to the left to download the task.  Choosing an appropriate, systematic way to collect and organize data.  Describing and explaining findings clearly and effectively.